The two baby birds that we have here have started leaving the nest and I didn't know it would be this soon. It scared me this morning when I only saw one bird still near the nest. I thought that the other one had either fallen to it's death or some predator got it. 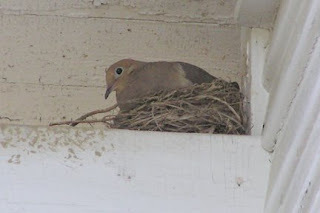 Later this afternoon I went out to check on the one bird still in the nest and saw momma bird fly away from the ground. I started looking for the other baby and found it in our neighbor's yard. 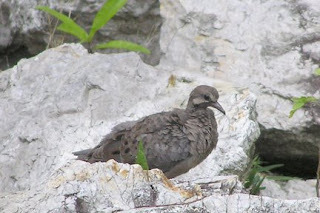 I was concerned and felt the need to help but decided to find out about baby doves. The info I found says that they leave the nest 2-3 weeks after hatching and flutter to the ground. 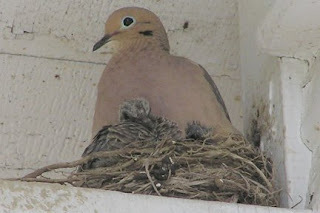 Momma and Daddy stay close by and continue to feed and protect them until they are strong enough to fly away. That makes me feel better and relieved to know that I don't have to try and save the baby bird. 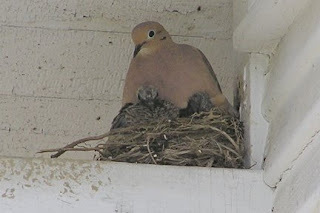 Momma bird knows what she's so I will leave them alone. They sure have gotten bigger! Well, I guess we're officially ready for labor and delivery since we received a certificate from our last lamaze class tonight. However, I don't think we really are ready just because we got a certificate. We now know the basics but I don't know how anyone is fully prepared for what is to come. Good grief! I have started swelling up like a blowfish. It's pretty uncomfortable. I have some swelling in my hands but mainly in my feet. I feel like I have aged significantly as I hobble around the house with my swollen, sore feet and I go to bathroom like it's my job. It's crazy! I try to drink more water hoping that will help but it just makes me have to go to the bathroom even more. I'm probably over exaggerating a bit but it's such a strange feeling. I'm not miserable. It's just something I'm having to adjust to at the moment. The baby is kicking and moving more these days. I found out the hard way the other night that eating ice cream before going to bed is a bad idea. It was like crack for the baby. I couldn't go to sleep because the baby was kicking me like I was a soccer ball. I couldn't believe it! I'm not doing that again. The baby's room is still a project. 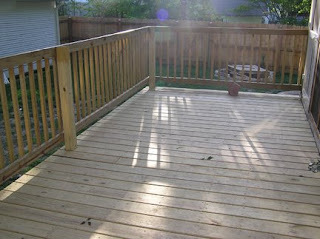 However, Eric got alot done in there this past weekend. 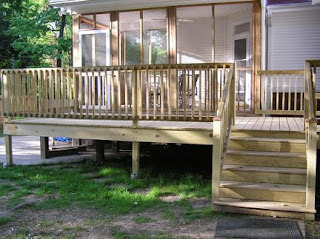 Soon it should be done and we can move onto other projects. I'm just looking forward to everything being finished and not having to worry about anything last minute. I'll keep my fingers crossed. My last doctor's appointment went well. No gestational diabetes. That test wasn't that much fun. I had to drink a really sweet, flat orange drink that as I got to the end was hard to get down. Right after I drank it I felt a rush of energy. Not long after that I crashed and burned. I couldn't believe how poopy I felt. I'm glad that's over with. I have another appointment this Friday for just a regular check up. I have started going to the doctor every two weeks. In the next couple weeks, I should have another ultrasound. It will be our last one before we really get to see the baby. Crazy! It's going way too fast. Only 12 more weeks to go! 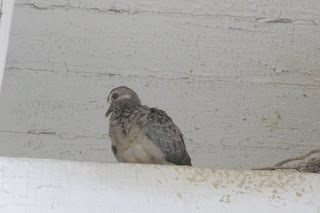 Remember the picture of the momma bird sitting in her nest? She has babies! I only see two babies so I am assuming that's all that's in there. I can't imagine there being anymore than that simply because the nest looks too small. They are so cute! I will try to get more pictures of the babies to keep track of their growth. 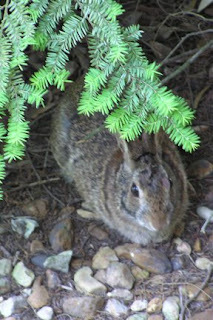 When I got home this afternoon, a little bunny was sitting by my front sidewalk. I didn't see him but he saw me and took off quickly as I approached the house. It scared me to death! 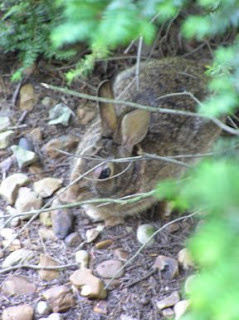 I went up on the porch to look in the yard to see where he went and I found him under a tree near our front porch. The pictures aren't great because I needed my flash but I didn't want to scare him away. He sat there for over an hour and just recantly reappeared. 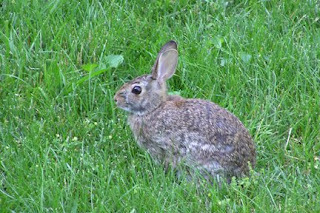 I was able to get a picture of him in the yard. He's probably enjoying the nice, tall grass and thought that nobody would be able to see him. He's super cute! 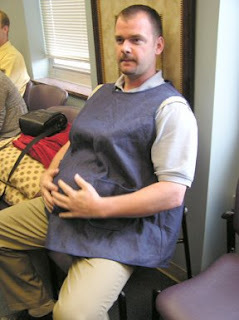 We had another Lamaze class tonight and Eric got to wear the prego suit. It was pretty funny. He started asking for ice cream and asking for this and that and demanding a back rub. I just laughed at him. He was definitely a good sport about it. Here are some pictures of him in the suit. Last night I was playing around with a monitor that I have. (it's very similar to this monitor) I'm able to hear the noises that the baby hears and most of the time I can hear the little kicks. The baby doesn't really like the monitor too much. It always seems to kick in the place where I have the microphone. As I was listening, I found the heartbeat! I couldn't believe it! I never thought that I would hear it with this little device but sure enough, I did. I gave the ear phones to Eric and he was able to hear too. We tried to count it but it was a little difficult. I could hear my heartbeat in the background. It was really neat and exciting. 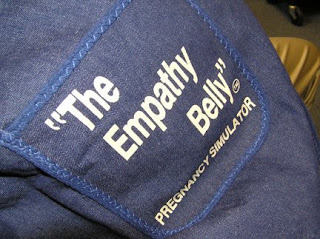 Now I will be sure to find the heartbeat every time I use the monitor. 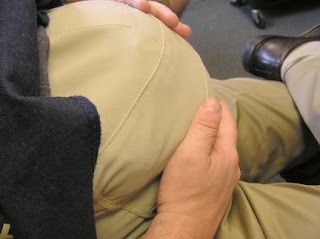 Eric and I started a Lamaze class yesterday. It's every Tuesday for five weeks and I wanted to go ahead and get it over with. The next time it's offered isn't until July and I don't want to wait until the last minute. Plus, Eric will probably be traveling more that month so he doesn't have to in August. Another couple that we know that lives in our neighborhood is also going to the same class so that makes it more fun. Last night was pretty basic since it was the first one. The instructor explained about what we can expect in the class and she talked a bit about labor and then we watched a video. 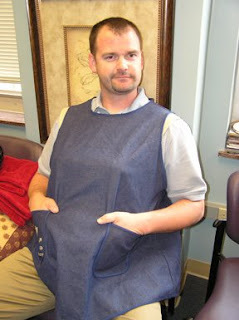 There is a pregnant belly suit that the dads get to take turns wearing. Only two dads got to wear it last night so the next time we go I'll get a picture of Eric wearing the belly. It weighs 25 lbs. and they have to bend over and pick something up and just wear for awhile. I can't wait until it's Eric's turn. That should be interesting. 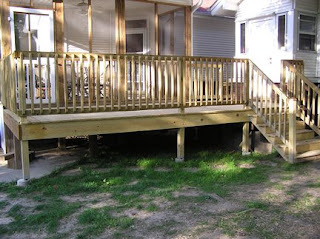 Eric finished the deck over the weekend so I took some updated pictures. It looks awesome! 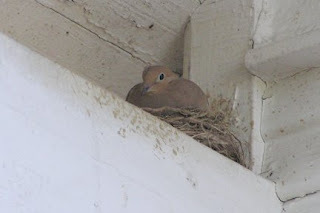 Here are a couple pictures of a bird that has decided to nest at our house. She has been sitting in the nest more recently so I was able to get a picture. I don't think she leaves it much anymore. Hopefully nothing will disturb her and the eggs and we will have babies. I'll keep my eye on the nest to see what happens. I had my appointment this past Tuesday and everything went well. I go back in 2 weeks for the diabetes test and my RhoGAM shot (the shot I have to have because of my negative blood). Then, I'll be going to the doctor every 2 weeks. It's crazy to think how fast this pregnancy is going. August will be here before we know it. Unbelievable! I'm looking forward to it but I'm also not really looking forward to it. It's scary and exciting at the same time. AHHHH! I got to see baby Tiana for the first time. She is a cut little baby. I held her and Eric and I got a demonstration on bath time in the tub that we have. Not too bad. It was nice to see that it may not be as hard and frustrating as I thought especially once we get a hang of it. Of course I did NOT volunteer myself for diaper duty. I figure I'll just wait until we have our own. We put together the bouncer and swing that we got and Tiana loved them both. It was nice to see how they worked and I am really glad that we have them. They are the best! Now, we're really going to focus on getting the room ready. There's not alot left to do but I just want it done. I will take some more pictures of the room when we get it all finished.